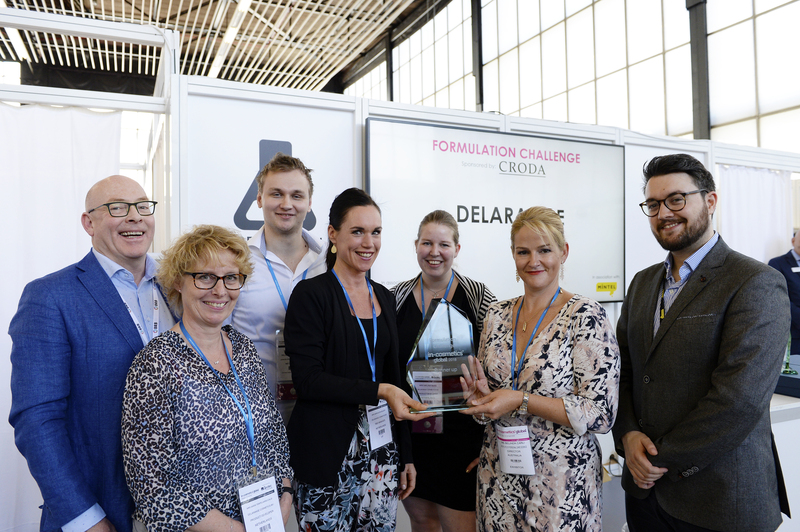 Delarange Cosmetics BV is proud to announce that we won an award at the In-Cosmetics Formulation Challenge 2018 in Amsterdam. Our R&D team rose to the tough challenge and developed a prize-winning concept in just 90 minutes. In this highly competitive field, Delarange managed to obtain the Runner Up Award. In this contest, six leading cosmetic manufacturers were given the task of creating an innovative formulation from a box of mystery raw materials. The competition consisted of company teams of very skilled professionals from Johnson & Johnson (France), Sabon/Yves Rocher (Israel/France), Florès (Netherlands), Herrco Cosmetics (UK), Naturalps (Switzerland) and Delarange Cosmetics (Netherlands). The resulting concepts – including a marketing strategy summed up in bullet points – were presented to a jury of market specialists. As the jury commented, Delarange’s concept stood out due to its holistic approach, its modern user story and its “spot-on” appeal for the target group, which consists of millennials who spend a significant part of their time on social media. For this avant-garde, hard-to-please and volatile group of consumers, the Delarange Team created a range of products consisting of a cream and a serum which can be used to be #selfieready, whenever required. These products instantly give the skin a wonderful satiny look, improving its tone whilst temporarily reducing wrinkles, pores and other imperfections. It is an innovation that helps this generation to share their story on Instagram #nofilter, providing an excellent concept with considerable new-business potential.